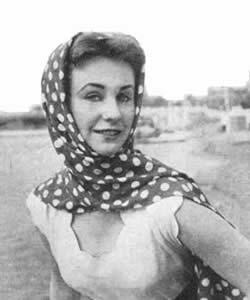 "Capped to catch the eye" in 1952. 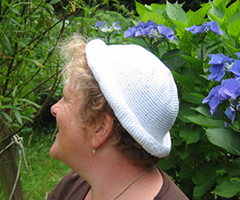 This cap can be "worn with a purpose on windy days for cliff-top walks or out at sea, or just for extra prettiness at any time". "Leave it plain or dot with beads" - and - "for teenagers only - roll up the brim in jaunty sailor style". 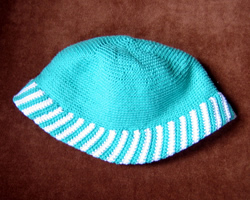 Instructions are for 2 versions - one plain and one with striped brim. Both crowns are worked the same. Begin at centre crown. With number 11 hook, make 4 chain, join in a ring with slip stitch. Work 6 dc through centre of ring. In all following rounds, work through the back loop only of each dc to get a ridged effect, and mark the start of each round with coloured thread to check increasings. 1st Round: * 2 dc in 1 dc; repeat from * to end. 18th Round: * 1 dc in 1 dc; repeat from * to end. 19th-34th Round: As 18th round. With number 11 hook, and white yarn, make 23 chain, turn. Miss 1 ch 1 dc in each of 22 ch. Next Row: * 1 dc in 1 dc; repeat from * to end. Next Row: Miss 1 dc, * 1 dc in 1 dc; repeat from * to last dc, 2 dc in last dc. Next Row: * 1 dc in 1 dc; repeat from * to end.Join in white. Continue repeating from  to  until strip fits all round the lower edge of the crown. Do not stretch this strip but allow it to fit comfortably. End with 2 rows of contrast colour. Fasten off. Fasten off the crown section. 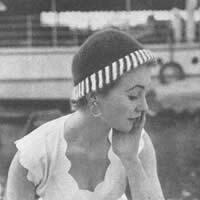 Join short ends of striped brim. Pin in position round edge of crown, right side of brim to right side of crown. 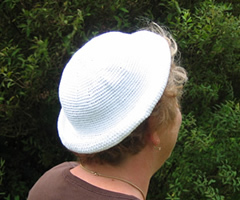 Oversew neatly with matching cotton; fold brim in half, and slip stitch to edge of crown on wrong side. This is worked with the yarn doubled. Join a second strand of yarn in with the crown section, and using a number 10 hook, work 9 rounds of dc, but always working through both front and back loops of each dc in the row below. 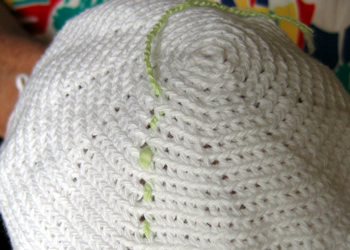 Finish off with a row of slip stitches, but take care not to do this too tightly or the brim will be too small. Sew in ends and optionally embroider 5 rows of beads around the crown, as shown in the photograph. Plain: 2 x 50g ball Phildar Phil Crochet, in white, (100% cotton, 201yards). Optional assortment of coloured glass beads. in main shade, (07 Veronese), with 1 x 50g ball of contrast (white). 3 balls (2 in white) made both hat versions. Nos. 11 (3mm) and 10 (3¼mm) crochet hooks. Remember these are English crochet instructions where dc is equivalent to US single crochet, and so on - see "Terminology" in the side bar. 7 dc to an inch. Check the tension and your head measurement carefully; the original was made in angora which is more stretchy than pure cotton. Note: these are UK crochet instructions - to work a double crochet: insert hook in next stitch, draw loop through, wool over hook, and draw through both loops. To fit "an average head". However, the hat size can vary quite a lot according to your tension. Original specified 2 x ½oz balls of Patons Fuzzy Wuzzy Angora. I was so taken with the another seaside idea on the same page as the hat that I felt compelled to share it with you here as well. but silk is best if you can afford it, as it's less slippery - cut it in half lengthways, join the short ends neatly, slip hem the long raw edges, and you have a manoueverable long stole, which can be worn in all sorts of ways and is so much prettier and smarter than a triangle tied under your chin. 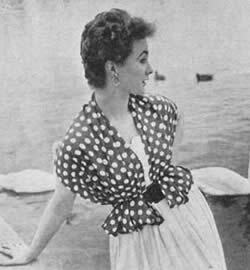 AS A CARDIGAN - round your shoulders, ends tucked up and over your belt in two comfortable pockets. Carry it around on holiday and it will be a godsend for those chilly moments, and less bother to carry than a cardigan. 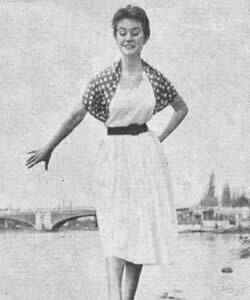 Tie it round tyour waist as a sash when you don't want to carry it.